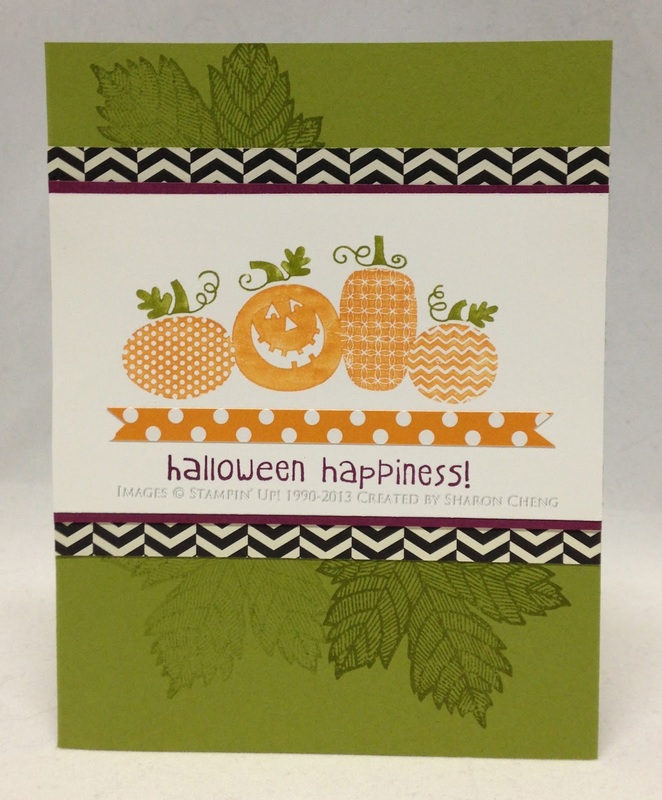 This card features two items from the upcoming Holiday catalog, the Halloween Happiness and Magnificent Maple stamps. It also uses two designer series paper which are on special through July 31st, Modern Medley and Polka Dot Parade. 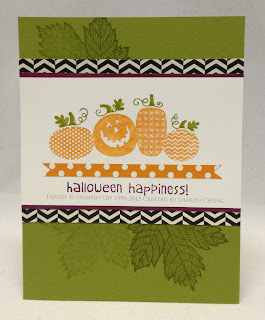 I cut the sentiment off from the Halloween Happiness stamp to make room for the Polka Dot Parade Designer Series Paper trim. It's the same technique that I used for this Ears to You card. With Stampin' Up! 's clear mount stamps, it's easy to separate the sentiment from the image. Then you can use them together or apart to give a fresh look to your projects. I used Pumpkin Pie, Old Olive and Rich Razzleberry markers to ink the image and stamped everything at one time. Then I added the Polka Dot Parade trim. 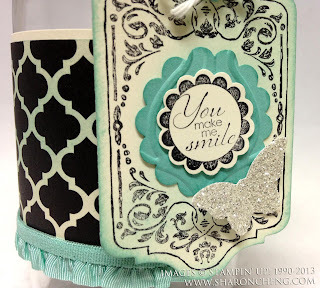 You may have already noticed that Modern Medley is my favorite Stampin' Up! designer series paper right now. I like black and white prints because they are so versatile. To add a little color, you simply sponge on the paper. 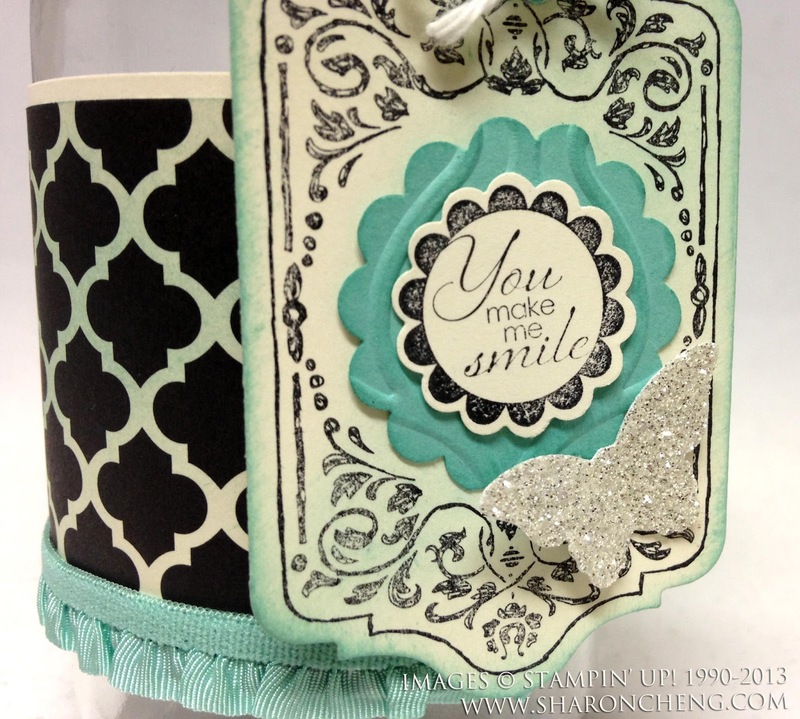 You can see where I added Coastal Cabana to the Modern Medley paper for this project. It marries or unifies the colors for this jar. Visit my online store to get your supplies for this project. The two stamps are in the Holiday catalog which will be available on August 1, 2013. Remember that when you purchase $25 or more in product, you are eligible for my Rewards Program.